As a member of the space using the OfficeR&D members portal you can add a bank account for ACH or SEPA payments yourself or let the admin add it for you. In order to be able to add a bank account to a member/company you're going to need to have a payment gateway integration activated. 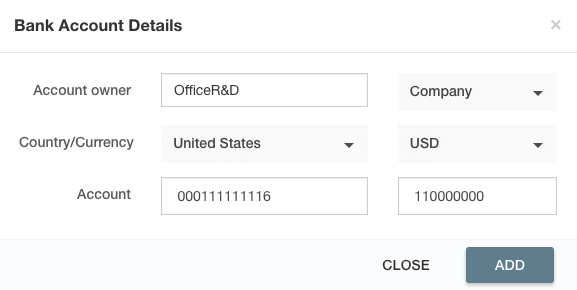 Here's our article on the payment integrations available in Office RND - there you'll find description of each integration and which of them give you the ability to add bank accounts to your customers' profiles. Go to your profile page in the OfficeR&D members portal. Open the Billing tab. You will see the Billing Details section there. Click the Add Bank Account button. Bank details form will appear - you can add your bank account details here and click "Add". Two small amounts will be deposited to the bank account you added. The transaction could take up to 3-4 business days before appear in your account. Once you see the amounts in your bank account you should come back to this screen and click the verify button. Then you should input the two amounts in the boxes and click Verify. Once verification passes the form will close the status will change to Verified.